Irish literature, poetry and song touch hearts around the world. It’s hard to deny that we Irish have a way with words. But most of the words we are famous for are in a foreign language – English. Yes, English is the dominant language in Ireland by far. But we are officially bilingual, and the Irish language is a required subject in every grade of primary and secondary school. Some schools known as gaelscoils use the Irish language to teach all subjects. All official signs are in Irish and English. Buses and trains bear both the Irish and English names of the destinations. People in Ireland have the legal right to conduct any communication with the government in either English or Irish, and government publications are produced in both languages. Three of the main political parties have Irish language names (Fianna Fail, Fine Gael and Sinn Fein). The police are known by the Irish name An Garda Siochana. The TG4 television channel broadcasts shows in Irish, and most radio stations include some Irish language programing. Cartoons dubbed in Irish are a fun way to immerse children in the language. Certain areas in the country are officially designated as Irish-speaking. In these Gaeltacht districts, families primarily speak Irish at home and businesses from grocery stores to factories to cafes to offices operate in Irish. But everywhere in Ireland, you’ll hear bits of Irish sprinkled into everyday conversation, often mingled with English in the same sentence. 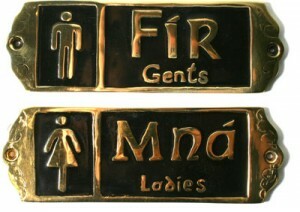 The Irish word for toilet, leithreas, is one of many terms used to refer to the facilities, and public restrooms are often labelled with the Irish words for ladies and gents – mna and fir. People will also mention going to their leaba, aka their bed. It is typical for an Irish person to insist they don’t speak Irish, then casually say ‘I’m heading to an siopa to get a litre of bainne, do you need anything?’ We are as likely to head to the pub for a séisin as a session of trad music. Most visitors have heard the phrase cead mile failte, a hundred thousand welcomes, or simply failte. The Irish gifts of wit and story-telling are rightly famous, and sometimes a good story includes many other possible avenues. Instead of taking down each of them, someone might say sin sceal eile (that’s another story), and either continue with the main story or conclude it, leaving you intrigued by that other story. When the stories are over and it is time to go, the people leaving will say slán agat, and the person saying will say slán leat. Irish gifts also include some lovely phrases in gaeilge, particularly Celtic jewelry. A ring or other piece bearing a romantic phrase such as mo chroi (my darling) or mo anam cara (my soulmate) is a beautiful way to show love of both your beloved and of Irish heritage. How the Irish use English is sin sceal eile. One of our Irish gifts is the ability to take the English language and use it in a way that sounds delightful while confusing everyone else.